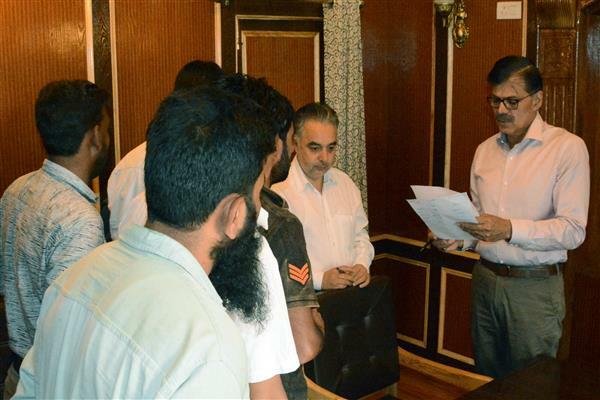 SRINAGAR, SEPTEMBER 12 (KNO) : Under the ongoing public outreach initiative of the Governor's Administration, Advisor to Governor K Vijay Kumar today met several public delegations and individuals at JK Governor's Grievance Cell here to listen to their grievances and ensure appropriate redressal. During the Public Grievance Camp, 24 delegations and 23 individuals apprised the Advisor of their grievances and sought his intervention in ensuring outcome-based redressal of the same in time-bound manner. The deputation from High Ground Anantnag sought Advisor's intervention for release of pending rent against use of their land by the government agencies. A group of casual labor’s working in Forest Department put forth their concern and seeks Advisor’s intervention for regularization of their services. The deputation of Paramedics working in NHM also presented their case and requested for due consideration of the government for resolution of their issue. Various other public delegations and individuals hailing from various parts of the state apprised the Advisor of their grievances, issues and demands and sought their early redress. Individuals who met the Advisor put forth their demands which mainly include clearance of SRO 43 cases, water & power supply, flood relief, health services, supply of timber road connectivity etc. Earlier, K Vijay Kumar reviewed the progress report on status of grievances registered by the public via various modes with JK Government Grievance Cell.